I think for me my love of Chex mix began when I was a little girl and our neighbor next door always offered me gum drops and Chex mix. I remember thinking that she had this magical house with an endless supply of both. As I grew up we would stop at her house from time to time even after my husband and I got married and sure enough she would pull some Chex mix out for us to eat. This is such a “frugal” snack mix as I wait until the Chex cereal is on sale and you know I think a couple of the flavors except for the wheat you can get in generic cereals anyway. Then I use a coupon on top and if I am using nuts I already have many times my biggest expense is the pretzels and you can get them a the dollar store if you want. I like to buy the big pounder bags so I can make a couple of batches. So in all actuality for the volume of Chex mix you make it’s really a money saver. This jar above is huge and each batch I make fills it up. I am getting ready to make my fourth batch. My son loves packing it in his lunches during the month of December and it’s just a great delicious snack to have around. I don’t use the bagel or pita chips they recommend but I do follow the basic recipe on the box for the most part. Chex mix is a great way to use up nuts that haven’t all gotten used up because the cooking and roasting process really freshens the nuts and brings out their nutty flavor. 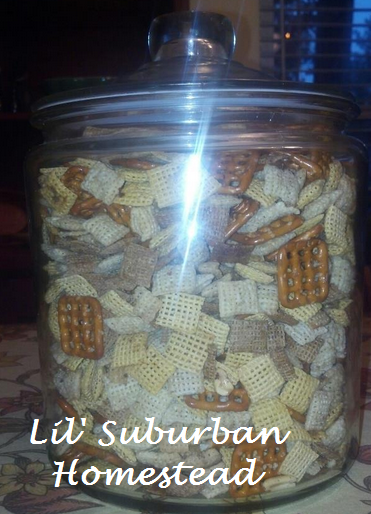 I usually start making Chex mix right after Thanksgiving and I cannot keep the container full. It’s interesting because I started making Chex Mix for New Years the year Pet Cemetery came out on video I don’t even know what year that was but clearly the movie was so startling I can’t ever forget when I started making Chex Mix at my household and it just stuck. What is one of your “foodie” holiday traditions? 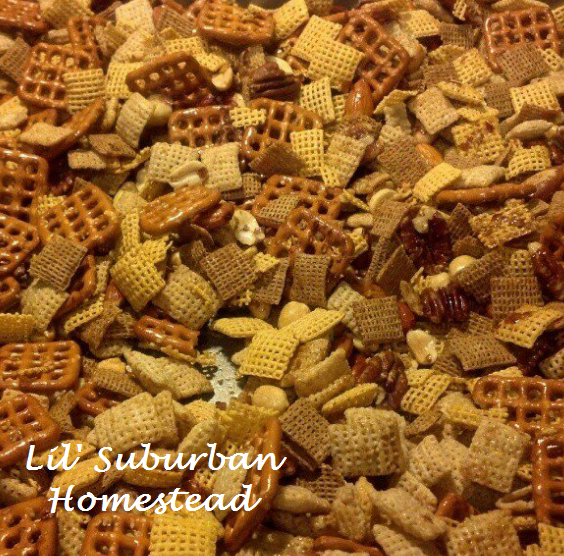 Tis’ the season to have Chex mix in your house! Have a great Sunday everyone! I almost want to end the post with can you guess how many times the word Chex Mix was used in this post….ha ha LOL! Have a great holiday season everyone! 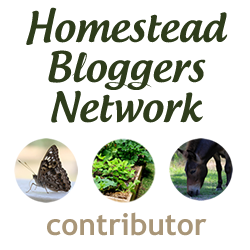 Too Many Pine cones In Your Yard? Make a DIY Pine Cone Wreath! Just made something similar, but with melted white chocolate on everything. I’ve never made the savoury version before – I’ll have to give this a try. Heidi I’m afraid I have eaten too much of it this month but it is so delicious! Let me know what you think! Prefer the savory to the sweet….not that I can eat it anymore, but it does make great gifts 😉 Yours looks terrific in that big glass Karen.